A few days ago I came back home after a trip to Nigeria where I was participating in “Playable City Lagos”, organised by Watershed and the British Council. The aim of the 10 day program was to encourage new thinking, relationships, and ideas around the theme of a Playable City. It involved a number of creative people living Lagos as well as a few of us from Britain, and we spent the first few days getting to know each other and exploring the conceptual basis for this theme. What does it mean for a city to be “playable”? Why is it important? Can residents of a city like Lagos afford the time to play, when the legendary traffic jams force people out of bed at 5am? The group discussions and personal conversations that came out of these first few days were fascinating. It was such a privilege to be able to dig deep into the identity of the city, hearing about day-to-day experiences as well as larger generalisations and patterns. We eventually split into groups in order to develop ideas that we could put into practice and test in the city. I ended up working with Desiree Craig, Inua Ellams, and Jeremiah Ikongio, a fantastic group – our only problem was that we had too many ideas. Eventually, however, we decided to try and make something that focused on Danfos. 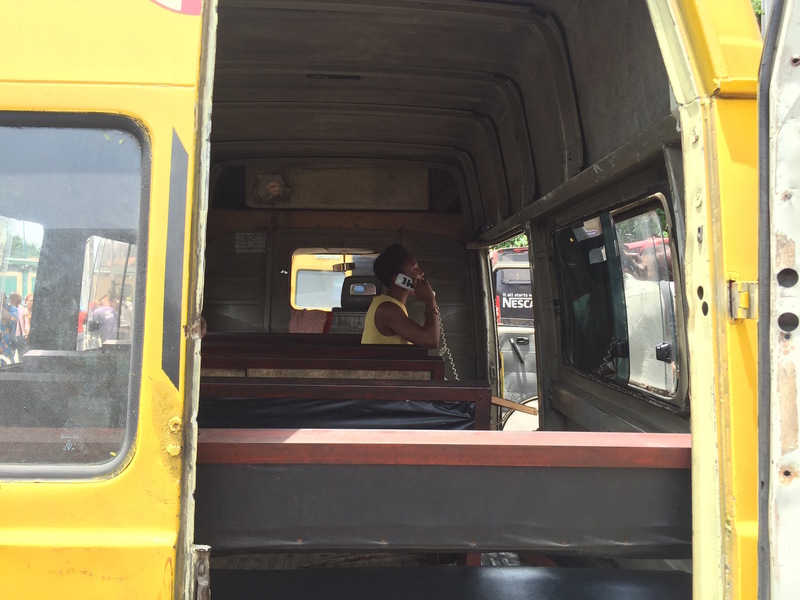 These are the yellow minibuses that operate as one part of a multi-layered public transport system within Lagos. They are publicly regulated but privately run – putting them somewhere in between the informal motorbikes and the big fancy BRT buses which wouldn’t look out of place in any European city. Incidentally, the Nigerian artist Emeka Ogboh has done some really great work about the sound of Lagos in general and danfos in particular. 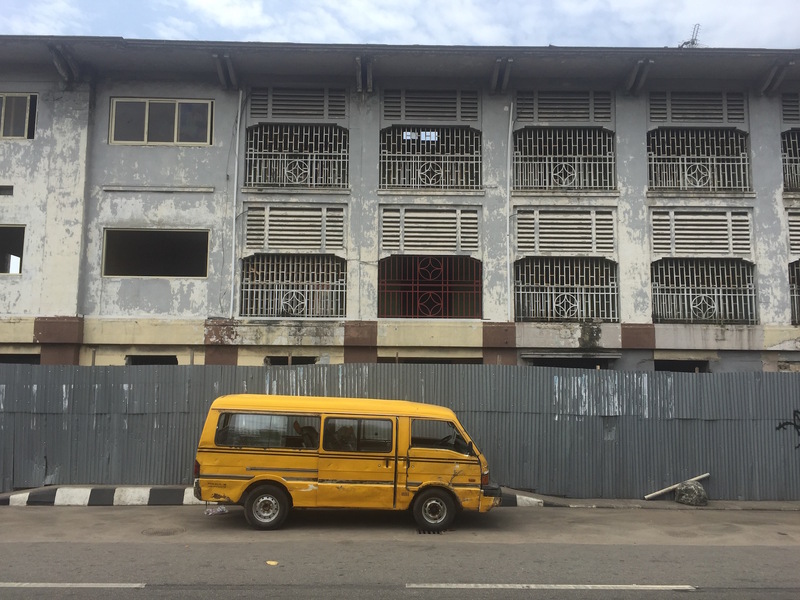 You can’t go very far in Lagos without seeing a danfo, typically crammed full of people and in varying states of disrepair. They are cheap, easy to use, and very democratic – several locals told me that in any danfo you’ll get a nearly perfect cross section of Lagosian society. I found this fascinating, which shouldn’t be a big surprise because I keep finding myself doing projects about public transport. 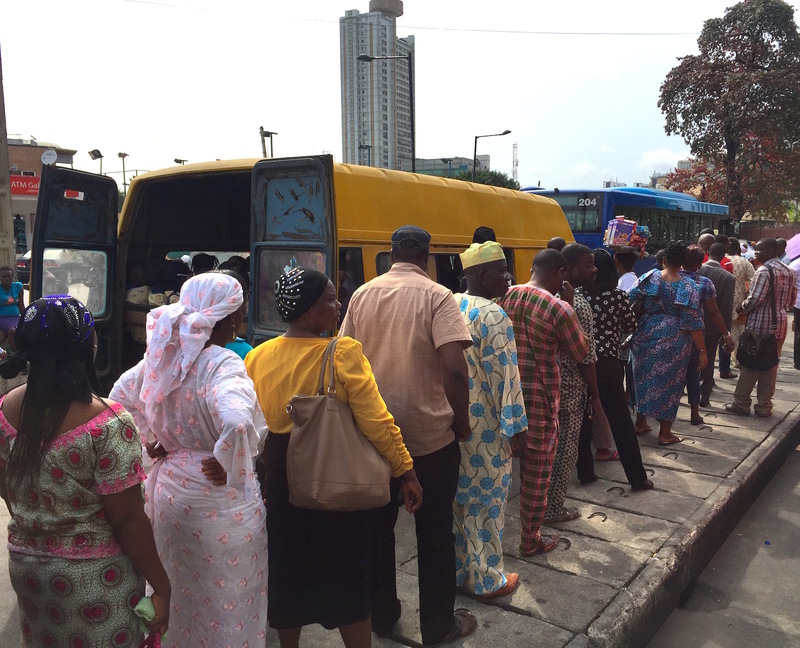 There is something very interesting to me about how at given moment in Lagos thousands of people are having something of a shared experience: sitting in a danfo, surrounded by strangers, on their way somewhere (and probably stuck in traffic). As a group we started thinking about how we could play with this idea, and we came up with the idea of connecting random people in random danfos. What would happen if you could start up a conversation with someone you had never met who is in the same situation as you, but in a different place? What would you talk about? What kind of serendipitous interactions could be created? And so we created the Danfone. The concept behind this is that a number of buses would be fitted with Danfones, which have only a phone receiver and some non-linguistic instructions. Picking up the phone would make a phone in some other random bus ring. If someone in that bus picked it up, you’d be connected and you could have a chat. If you hang up and try again, you would be connected to a different bus. That’s it! It’s an idea that I found pretty freeing in its simplicity. The lack of structure opens up a bunch of questions and unknowns, which I really liked. We didn’t have enough time to build a fully functional version of this, so we made a sort of proof-of-concept. We focused a lot on the design, making it fun and engaging (with some flashing LEDs of course), and making sure the interaction made sense. 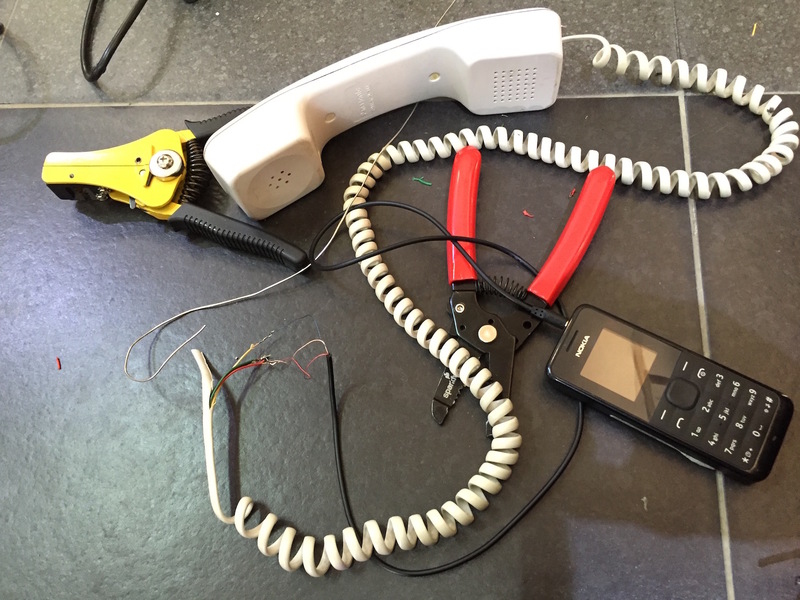 To that end we hacked an old fashioned telephone handset into a mobile phone, since we liked the idea of a really tangible interface with very little control. 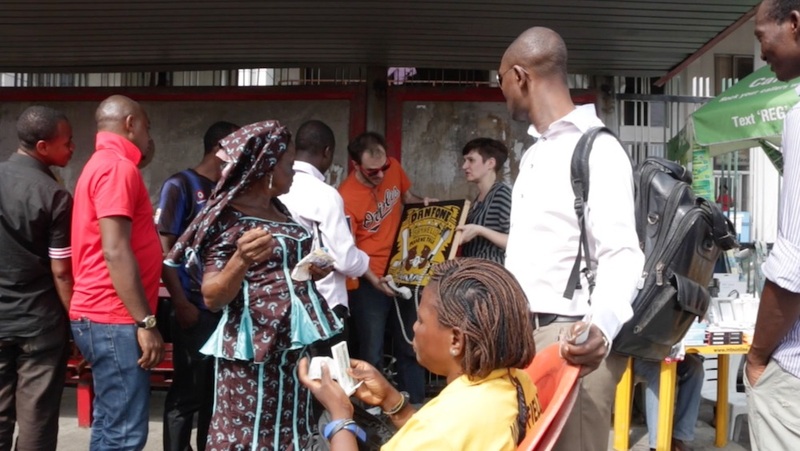 To test out our creation we brought it out to one of the main bus stops in the centre of the city, right next to Tafawa Balewa Square, and pitched it to the danfo drivers. The people at the bus stop (and on the way there) were remarkably responsive to the idea, with some really interesting conversations starting up about how it would work and how it would be used in practice. Several people mentioned how it fit well with the Nigerian traditions of group discussion and gossip (ofofo). 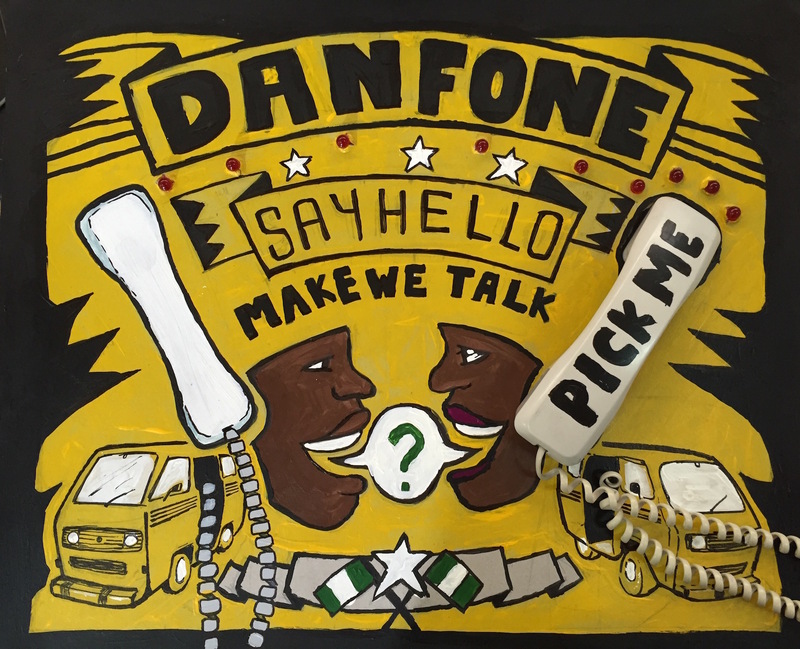 In practice the way we used our prototype was hilariously low-tech: we dialled the number of a mobile phone hidden in the Danfone, answered that phone and then put it all back together so you could only speak through the handset. Then we put the whole thing in a danfo and waited for people to interact. The incredibly patient Desiree waited for anyone to pick up the phone and have a discussion. We did this twice, once with Inua and Jere in the bus engaging with people who were interested, and once with Jere hiding in the back to see if anyone would pick it up. It was only really half of a test, but I would say that it was very successful. 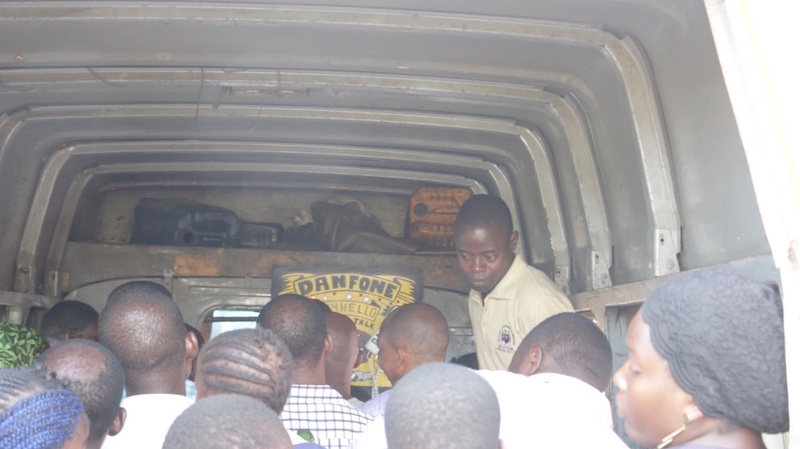 A few people spoke to Inua and Jere and tried it out, and on the second test a very curious person built up the courage to pick up the phone – only for the mobile to drop the signal! That was a bit frustrating, but by showing the limit of our prototype we also saw the potential for what it could be. As a part of our work we also thought about what future possibilities could be explored. For example, we considered a future radio show, “Danfo Diaries”, which could be built out of conversations between strangers on danfo buses. This could make for some pretty compelling listening, and encourage future conversations. I’m super proud of this project. I think it embodies the idea of playfulness really well – it does not get in the way or require extra time and energy, and it does not pretend to be creating extrinsic value. It is open and free and potentially magical (or funny or sad). 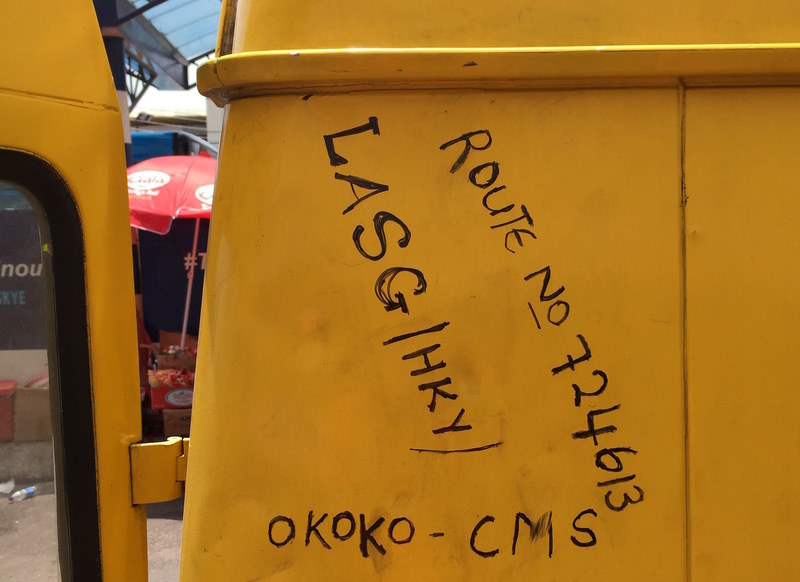 It’s really hard to sum up my time in Lagos in a blog post. To say it was an “incredible time” really doesn’t seem to do it justice. I learned so much and I’m only beginning to process it all. Whilst I definitely think that the Danfone is a powerful idea that can be developed further in a number of directions, for me it was only a part of the whole experience. Many thanks to everyone involved!